A-level Maths provides students with a thorough grounding in the mathematical tools and techniques often needed in the workplace. The logic and reasoning skills developed by studying A-level Maths make sure the qualification is widely respected even in non-mathematical arenas. A-level Maths is made up of six units – three at AS and three at A2. All units are available in the June series. 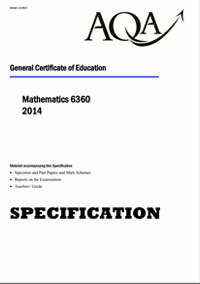 There are four Pure Core units which make up two-thirds of the qualification and provide the techniques in Algebra, Geometry, Trigonometry and Calculus that form the fundamental building blocks of the subject. Mathematical applications make up the remaining third of the qualification and there are various options to suit the needs of individual students. statistics – probability, data handling, testing hypotheses. Students can focus on one strand or study a mixture of any two. All units are of equal weighting and are assessed by an exam of 1 hour 30 minutes. Statistics 1 has optional coursework worth 25 per cent of the unit with an accompanying exam of 1 hour 15 minutes sat in June. A-level Maths provides a foundation for further studies in a variety of subjects including Science and Engineering.